My sister, the doctor, lover of pies and Peeps, is hosting Thanksgiving this year. She has it all under control, sleeping arrangements organized, color-coded cooking timeline mapped out, and the menu finalized, promising her 12 guests a turkey, a spanakopita, cranberry sauce (not this one) and pie. 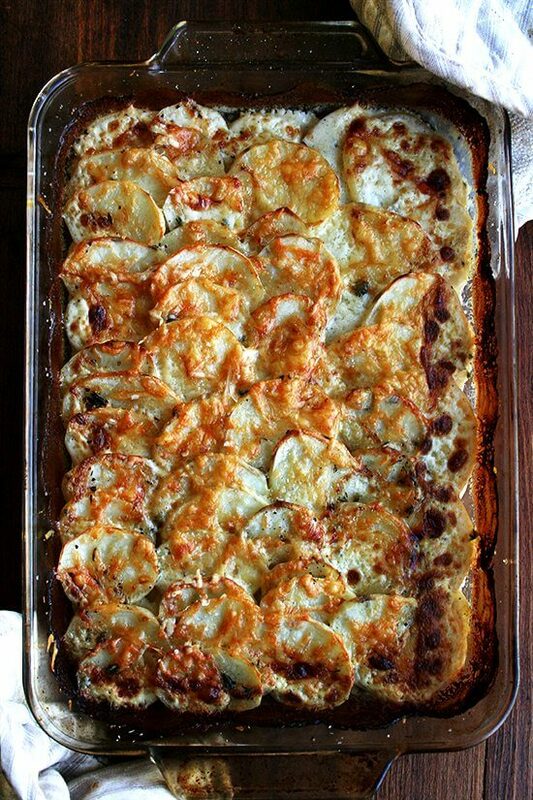 To help lighten her load, I’ve signed up to bring punch, stuffing, bread, and this potato gratin, a dish my mother has served at nearly every big holiday gathering for as long as I can remember, one that often steals the show no matter what it’s beside, turkey or otherwise. 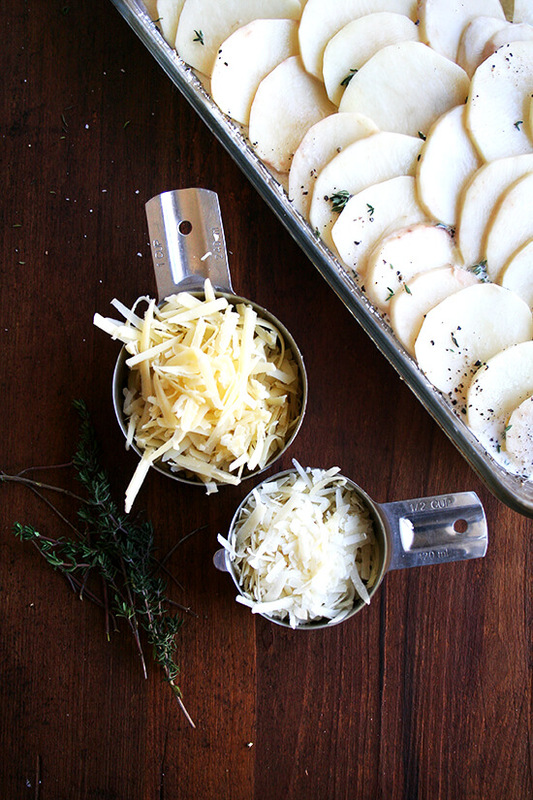 It comes from Chez Panisse Vegetables, which offers a number of enticing combinations — potato with turnips or celery root or leeks or sweet potato — but we almost always use potatoes exclusively and keep the seasonings simple too: salt, pepper, thyme and just a dash of freshly grated nutmeg. 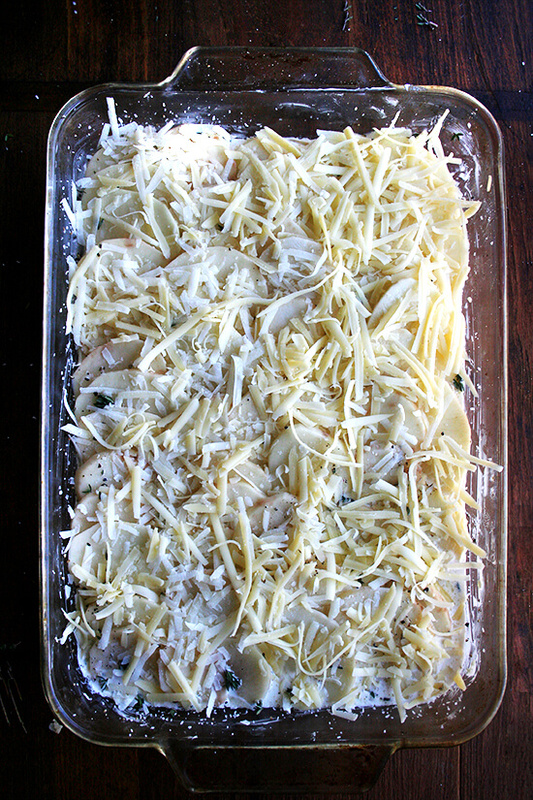 Submerged in a mixture of equal parts heavy cream and chicken stock, topped with a mixture of gruyère and parmesan cheeses, these potatoes emerge irresistibly crispy on top and creamy underneath. 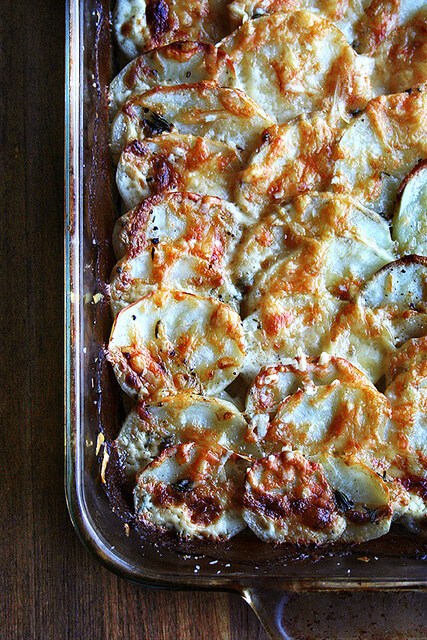 This gratin couldn’t be easier to throw together, and you can’t mess it up. I promise. Hope all of your Thanksgiving preparations are going well. 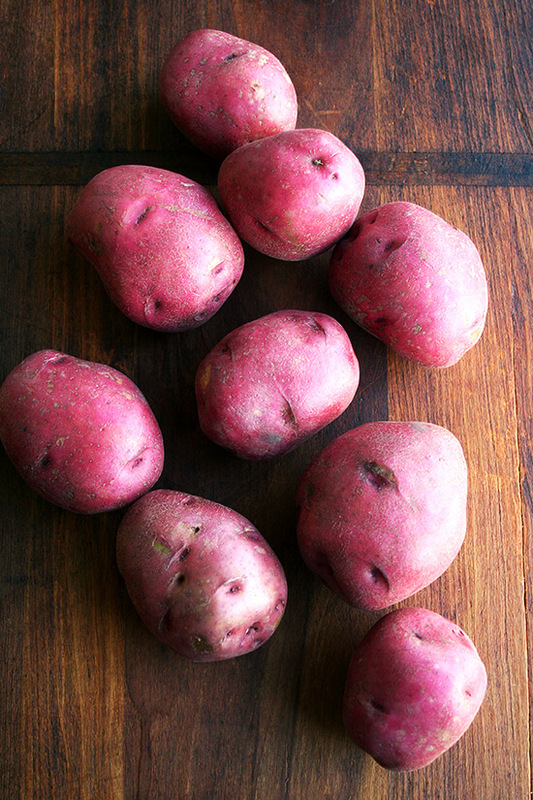 My mother swears by red potatoes. I’ve learned not to question. 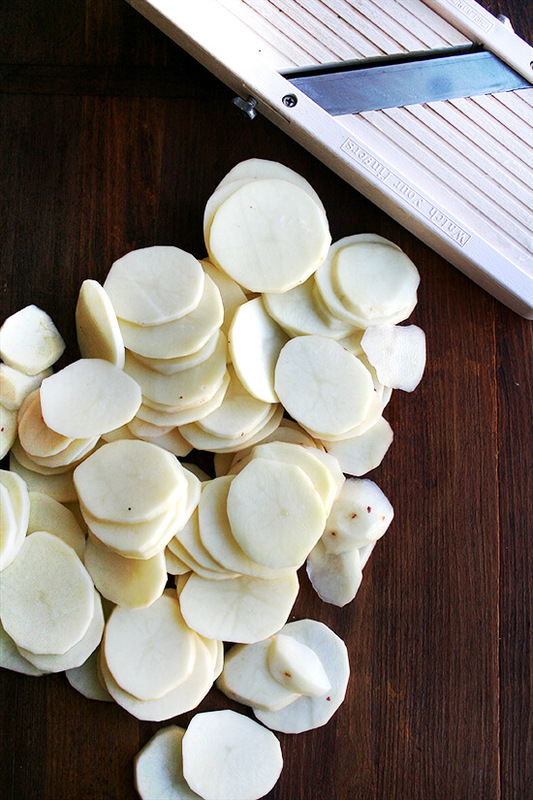 A mandoline makes quick work of the slicing, but if you don’t have one, don’t worry. 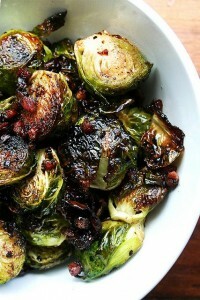 A few other ideas for Thanksgiving (images link to recipes): Red Wine Cranberry Sauce, Peasant Bread, Pomegranate-Green Olive Salad, Cheddar Biscuits, Balsamic Brussels Sprouts, Apple Sauce, Slow Cooked Kale, Philadelphia Fish House Punch, Cranberry Buttermilk Breakfast Cake, French Apple Tart, Apple Pie, Maple Cream Tart. And you can find a few more ideas here. Seriously, I cold totally skip the turkey. Rub an earthenware gratin dish with smashed peeled garlic and butter. 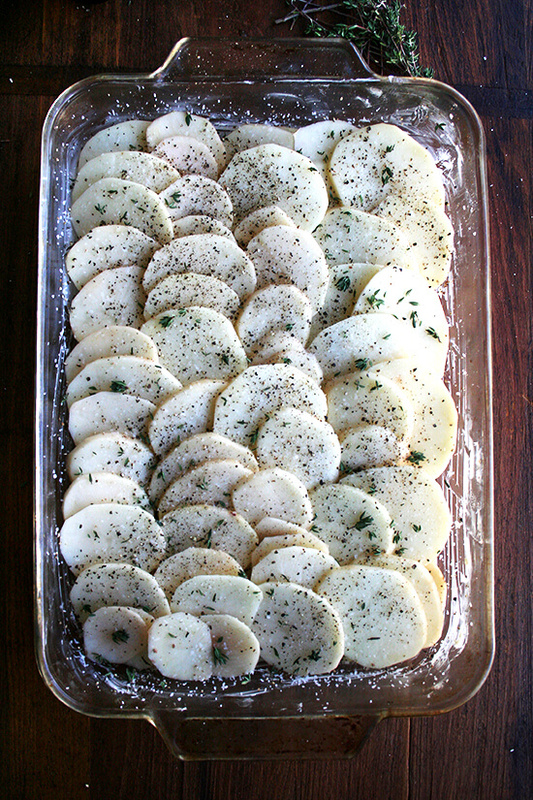 Layer overlapping slices of potato cut 1/8-inch thick. 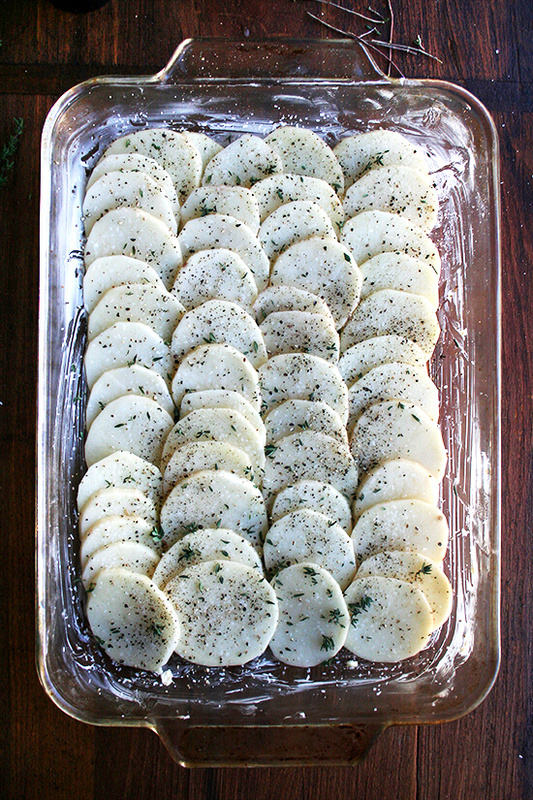 Season with salt, pepper, and thyme leaves. Make another layer of potato slices and season again. 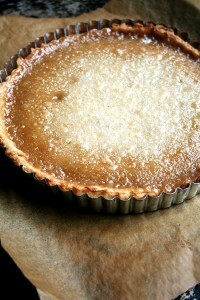 Moisten with cream, cream and chicken stock, or milk to the top level of the top layer of potatoes. 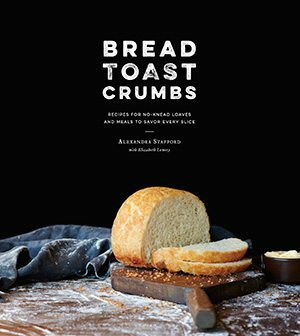 According to taste, sprinkle the top with grated Parmesan or Gruyère cheese, and distribute thin shavings of butter on top. Bake 45 minutes to 1 hour in a preheated oven at 375ºF (see temperature note below), until nicely browned. If you need to make this ahead of time, just reheat covered with foil in a preheated 350ºF oven for about 15 to 20 minutes or until cream-stock mixture is bubbling. Uncover if necessary for 5 to 10 minutes to get the cheese bubbling. Preheat oven to 375ºF. 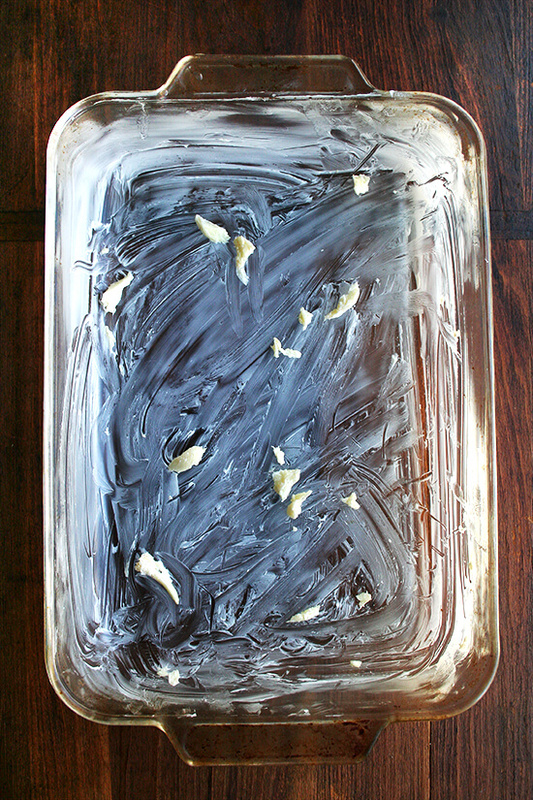 Rub an earthenware gratin dish (or 9×13-inch Pyrex) with smashed peeled garlic and butter. 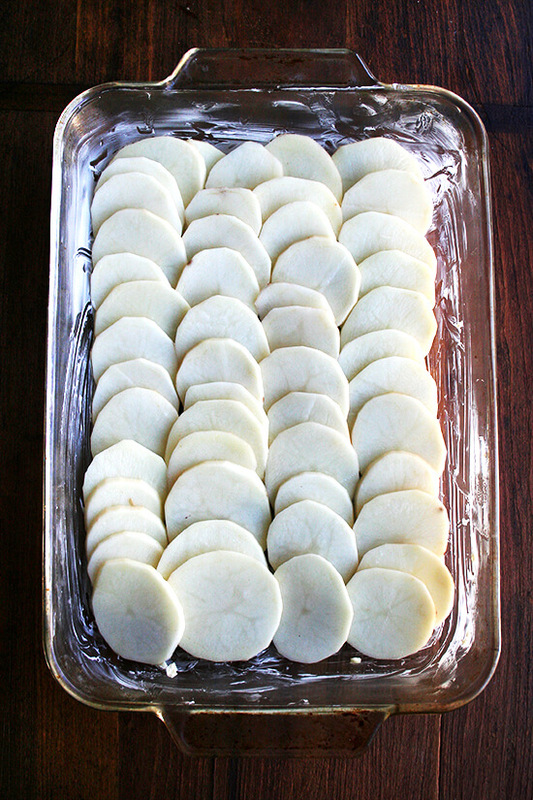 Using a mandoline or knife, cut potatoes 1/8-inch thick and layer overlapping slices in the prepared pan. Season generously with salt, pepper, and thyme leaves (no need to chop — just pull and scatter). Lightly grate nutmeg over top. 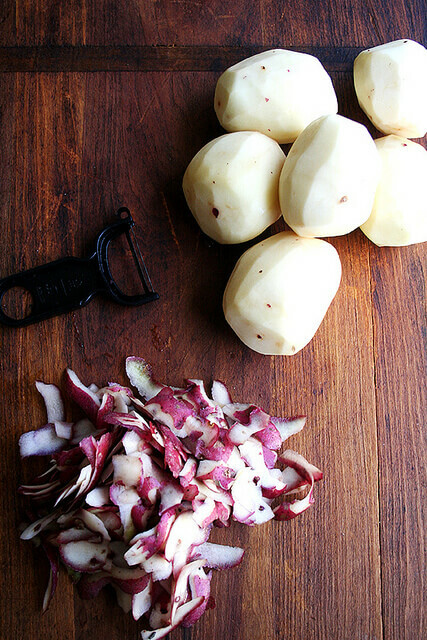 Make another layer of potato slices and season again in the same manner. Cover the potatoes with the stock and cream — you may need more to allow the liquid to get to the top level of the top layer of potatoes. Sprinkle the top with the grated cheeses. Bake 45 minutes to 1 hour, checking after 40 minutes or so to make sure the potatoes are not browning too quickly. If they are browning too quickly, cover the pan with foil and continue baking until the potatoes are tender and the top is nicely browned. You can also turn the temperature down to 350ºF if necessary. Simply gorgeous! Thoughts on adding cheese in between the layers of potatoes? 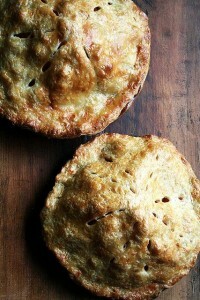 Added to Thanksgiving menu…thanks! Love this idea! Honestly though, it doesn’t need any extra cheese. 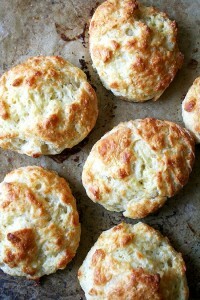 The cream adds enough richness, and the cheese makes the topping crispy. If you want it richer, I suggest using higher ration of cream to chicken stock (as opposed to equal parts). Make sense? Now I know why you are such a fabulous cook!!! I have been a longtime fan of your Mother. I have been to her restaurant in Berkeley. Pinned! 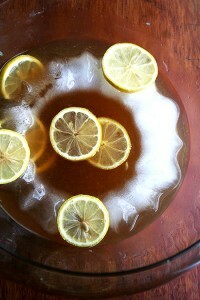 Along with the punch. Those will be my contributions this year. Can’t wait. 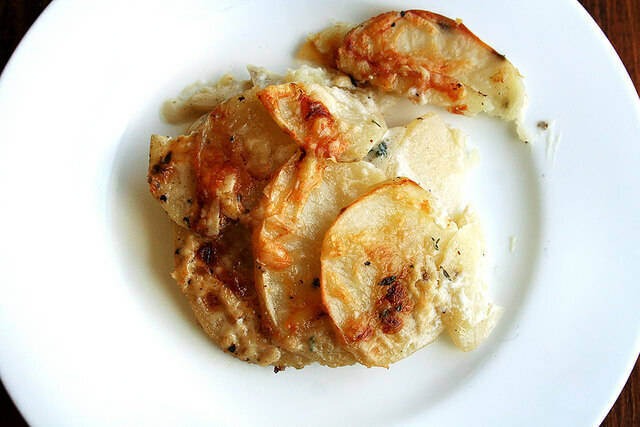 I much prefer a gratin to mashed potatoes, and this one looks irresistible. I might have to give this one a try, maybe with the celery root. Yum! Haha, that is hilarious! How fun that you are going to have a new stove before Thanksgiving! You aren’t going to break that thing in slowly I guess?! I love it. Can’t wait to see hear how it performs on turkey day! Happy Thanksgiving, Laurie! You are still a fabulous cook! I am pretty good at it and my mother isn’t Alice Waters!!! 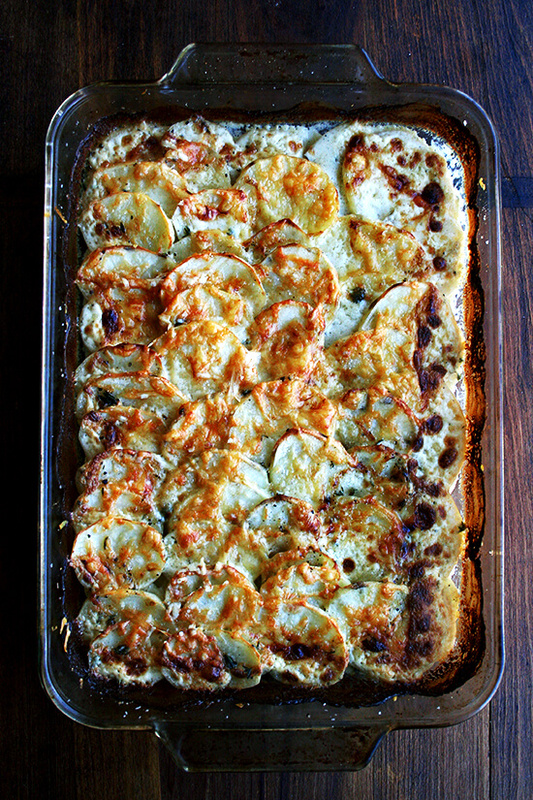 This gratin looks gorgeous, would love to see this on our dinner table during the holidays or in general. Can’t wait to make it! 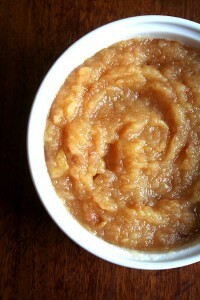 Man, you know I’m really a believer in mashed potatoes for Thanksgiving because of — gravy! But these have my mouth watering. They sound awesome! Maybe, since my sister-in-law always crosses her fingers that I will cook “traditional” dishes and not anything with too much of a twist, maybe I can bring these to my parents’ Thanksgiving dinner. Who cares, they’re going to be on my table one of these days very soon, holiday or not! 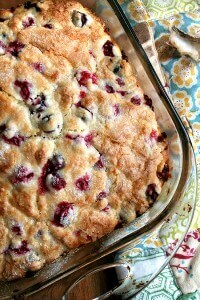 Love that you share family recipes like this with us! Makes it so special. Also, your sister sounds extremely organized. Not to sound braggy — I dont know if it is just coming with practice — but I am finally moving away from my time-lines and to-do lists for Thanksgivings, the process seems more predictable now. 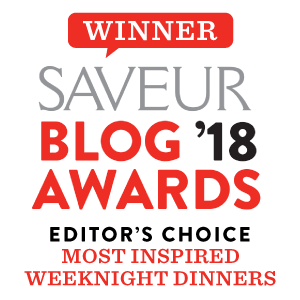 Perhaps it helps that I have settled on like the same turkey method, the same cranberry sauce, etc — at least I spend less time narrowing down my menu 😉 Thanks again Ali! I like your use of cream and stock so it’s not too heavy. Usually when I do something similar I usually do a white sauce which thickens up so because quite a creamy dish even though there’s no actually cream in it. Yours looks like the potato is the star rather than the sauce! That’s my mother’s doing, and I’ve only ever made it with equal parts heavy cream/stock, but my mom says it is way too rich when only cream is used. And you are right — the potatoes definitely aren’t lost here! 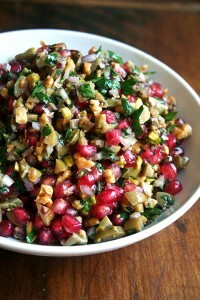 Ali, this looks so good! We are in Philly for Thanksgiving, but I am going to have to make this anyway… and maybe I’ll finally overcome my fear of the mandoline! Yes, you must! Do you have the Benriner? The key is to have something to secure the bottom, like the back of a cutting board (if you have one with a back lip) or even a towel. Also, wear that kevlar glove! Also, where in Philly? I am so jealous! 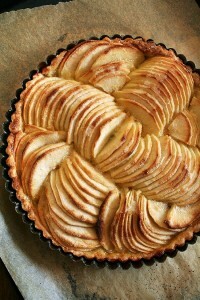 That is one gorgeous gratin!!! 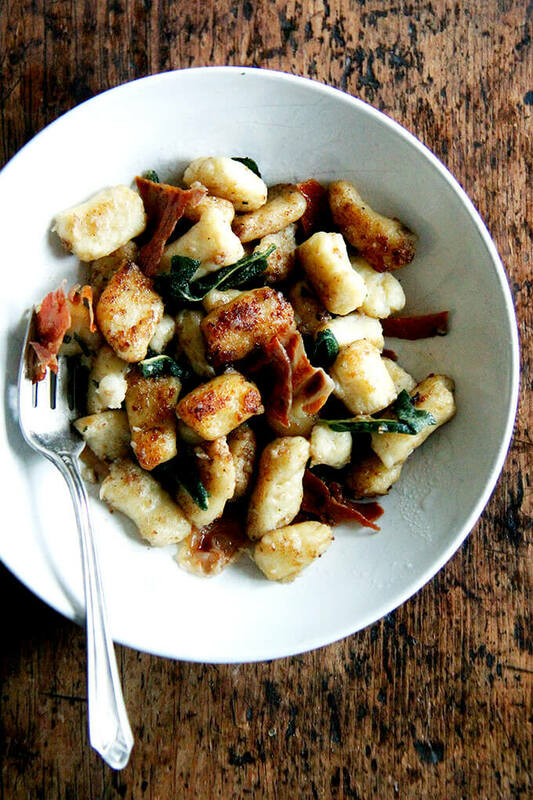 I love these potatoes; seriously – I LOVE this dish. 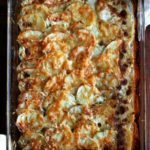 I use Parmesan, I use Gruyere, I use bacon, I use green onions – I use this dish to make all kinds of gratin potatoes and I LOVE this recipe. 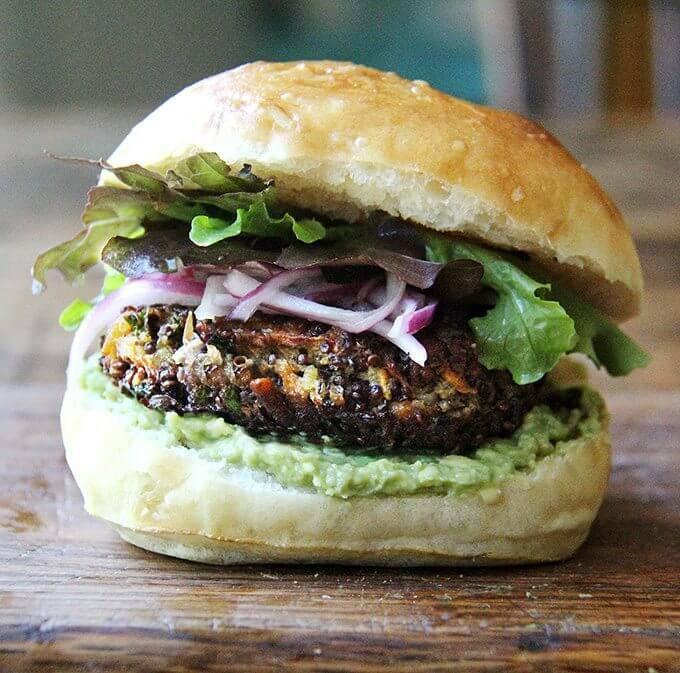 O my, O joy, O deliciousness – whole and good and wonderful. So happy to hear this Rene! You are funny. I share your enthusiasm for this too — it’s what I look forward to most every holiday, but I love making it year round too in various incarnations. Thanks for writing in! 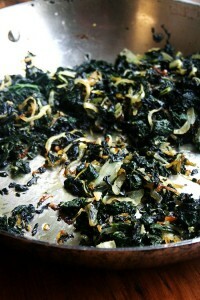 Love to make this dish for a special family gathering. I need to know if I can do the night before and if so at what point would I resume? Do you need to bake as soon as it is assembled? Please advise and be specific . Thanks for your help. I am making this week, hopefully! Hi Karen — this is definitely a crowd pleaser and it feeds a crowd, so nice choice 🙂 The farthest in advance that I have made this is Thanksgiving morning, and then I reheated it covered with aluminum foil until it was warm. I do feel it’s best made fresh and served when it cools briefly. I’ve never tried assembling it the night before, but I kind of think it might work. 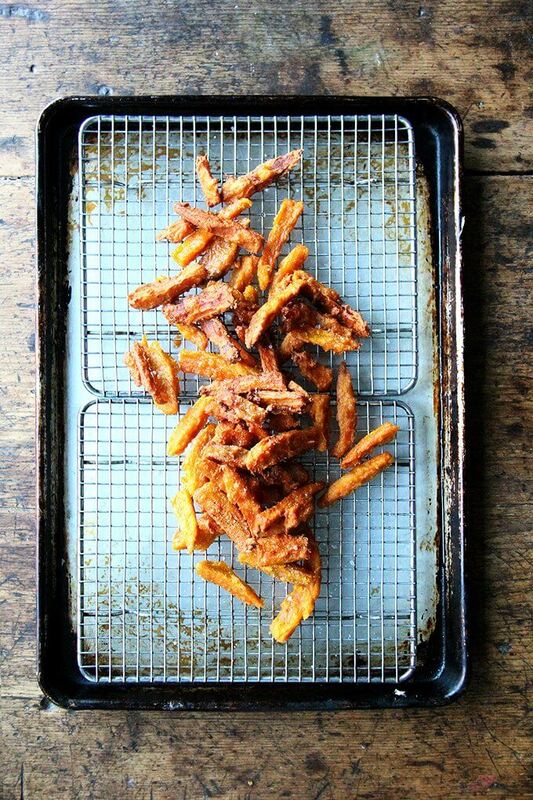 The reason I say this is that I have potatoes cut into fry-shape pieces that have been soaking in water for over a day now. They are hard still — raw potatoes don’t seem to soak up liquid and turn soft, so I have a feeling it will work. 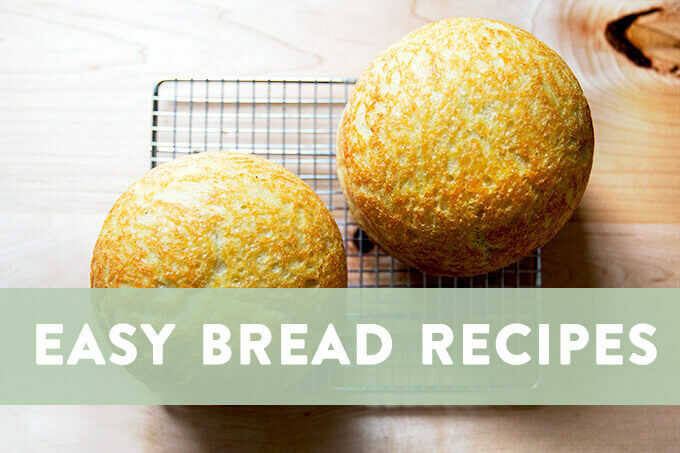 I would not top it with the cheese until the day you decide to bake it — grated cheese can dry out in the fridge. But I would make sure the potatoes are mostly submerged in the chicken stock-cream mixture, then I would put a layer of plastic wrap on top and press it into it so that any potatoes bobbing on top aren’t exposed to too much air. The next day, I would remove from the fridge while the oven is preheating. Grate your cheese, sprinkle it on top, and proceed with the recipe. Good luck! Let me know if there is anything else! 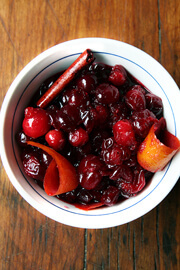 Made this with Christmas dinner yesterday, totally fantastic and everyone loved it. Thanks! Forgot to add – substituted gouda for the gruyere. AND I made the peasant bread as well, which as usual was a hit. 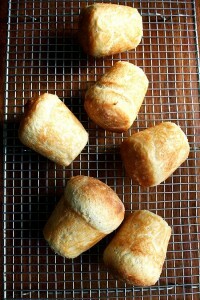 Am now attempting the prosciutto and gruyere croissants. Happy Christmastime! So happy to hear this, Jessica! I happen to have a ton of smoked gouda on hand — I wonder how that might work? — and a ton of potatoes from my CSA. I’m going to try your variation soon. Happy New Year! Do you think this would work if you substitute 1/2 & 1/2 for the heavy cream? I am very excited to make this dish! Thank you for this! It was a hit and all was devoured. 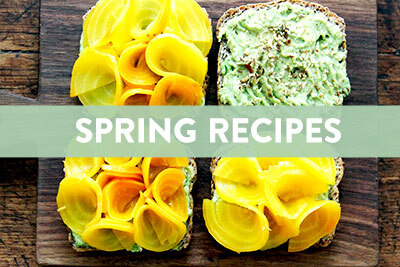 Very easy to make and tasty. Definitely a good note to pay attention to the amount of cream and broth. I did by listed measurement and could have used less. Then I saw the note to adjust per recipe. Either way it came out delicious and no leftovers! So happy to hear this, Rhob! Yeah, depending on the size of your dish and the amount of potatoes you use, you may need more or less, but it’s forgiving in the end! Made this yesterday as a test. Love the flavors! Love how it looks. Since it’s just me I left the skins on. My sauce seemed a little thin, about the consistency of whole milk. Is that how the sauce should be? 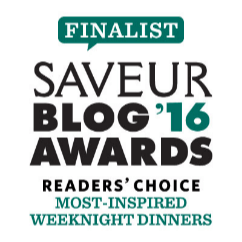 Should I have kept the gratin in the oven longer? The potatoes had a very slight “bite” to them but seemed cooked through. I thought they were terrific. Hi Bill! Nice to know that leaving the skin on works. I’ve always wondered plus I like skins generally. The sauce definitely is thin … it thickens the longer it is in the oven and as it sits, but it sounds as though it could have used a little bit more time given the way you describe the texture of the potatoes, which it sounds as though you like — given the potatoes had a little bit of bite, they probably could have stayed in the oven 10-15 minutes longer without turning to mush, which would allow the sauce to thicken/reduce a bit more. I think with a little bit of extra time, you might be happier overall with the sauce, and I think your potatoes will still be knife or fork tender.